The majority of aquariums in the world offer plenty to enjoy in terms of sheer volume, at the same time, they also feature exciting and informative exhibits. These aquariums not only are fascinating, but they are also atmospheric and make a visitor feel as if they have stepped into another world because they offer an opportunity to learn about the world beneath the ocean. Here is a list of the top 15 best and largest aquariums on the planet. The Georgia Aquarium, in Atlanta, Georgia, USA is a public aquarium that houses more than a thousand animals belonging to several distinct species. All of these species reside in 10 million US gallons of marine and salt water, making it one of the largest aquariums in the world. The Aquarium’s notable specimens include whale sharks, beluga whales, California sea lions, bottlenose dolphins, and manta rays. Also, the second section of the aquarium i.e. the Cold Water Quest features animals from the polar and temperate regions of the world. Since 2005, the Georgia Aquarium is the biggest aquarium in the world. It has encouraged visitors across the globe to witness the largest fish in the world i.e. a whale shark and the only thing that lies between them is a 2-foot-thick acrylic window. There are four whale sharks in the aquarium and all of the eat approximately 47,000 pounds of food each year. The largest aquarium in the world witness approximately two million visitors annually from different places in the world. The life support system of the aquarium makes sure to keep the water clean for 100,000 animals that live in the aquarium. Dubai Aquarium and Underwater Zoo are located centrally within 12 million square feet Dubai Mall. It is a focal segment of the Dubai Mall’s incredible and diverse leisure portfolio and also one of the most visited attractions in Dubai. The aquarium harbours more than 33,000 aquatic animals belonging to over 200 different species in its enormous tank with the capacity to hold 10 million litres of water. Also, this ten million-litre Dubai Aquarium tank showcases hundreds of sharks and rays, including the largest collection of Sand Tiger sharks in the world. In the Dubai Mall Aquarium, tourists can watch the animals underwater by cage diving. The experience allows visitors to watch sharks, stingrays and other creatures from very close (arm’s length) by remaining within the safe area. Also, the aquarium allows people to take a walk on the 48-meter long underwater tunnel that will give you an amazing 270-degree view of the aquarium. The acrylic walls of the tunnel will allow you to experience underwater life by keeping yourself in the safety zone of the tunnel. A well educated and informed staff will be provided to all tourist by the Dubai Mall Aquarium that will give you the unique facts and information about the aquarium and the species that live within it. The Okinawa Churaumi Aquarium, located within the Ocean Expo Park in Okinawa, Japan, is a member of the Japanese Association of Zoos and Aquariums (JAZA). It is one of the most visited attractions in Japan with over 20 millions visitor every year. Being one of the largest aquariums in the world is made up of four floors, with tanks containing deep sea creatures, sharks, coral and tropical fish. Churaumi” is a Japanese word in which “Chura” means “beautiful” or “graceful” in the Okinawan language, and “Umi” means “ocean” in Japanese. The huge acrylic windows of the aquarium give tourist an amazing view of marine life. The walls are 8.2m high, 22.5m wide and 60cm thick to give your required safety to watch the excitement of sharks, rays, migratory fish of the Kuroshio sea is indeed in your reach. There are three whale sharks in residence and largest one named as Jinta, however, much is not known about the regal creatures. It is the first aquarium in the world that succeeded in raising and breeding manta alfredi( one of the largest species of ray). The coral sea tank that shows Okinawa’s beautiful ocean has been designed without a roof. All species bathed in natural light in the 300m3 tank. The Oceanographic is the largest complex in Europe and also one of the best aquariums in the world. Opened in the year 2003, it includes 45,000 marine creatures belonging to 500 different species such as dolphins, sharks, rays, penguins, sea lions, walruses, beluga whales and many other fishes. Also, the park also includes a dolphinarium, an auditorium with a Red Sea aquarium, an area of mangrove swamps and marshland, and a garden featuring more than 80 different species of plant. The best part of this giant aquarium is the shark tunnel (tube-shaped aquarium) through which tourist can walk side-by-side with different marine animals like sunfish, manta rays and different varieties of sharks. Between you and aquarium there is thick glass, however, you will feel a rush of terror as Sand Tiger Shark swims slowly above your head by opening its flesh-ripping teeth. The TurkuaZoo also called as the Sealife aquarium is one of the largest aquariums in Europe. Located in Bayrampasa in Istanbul, Turkey, it is the first public aquarium in Turkey and a major tourist attraction for Istanbul. In addition to being the aquarium, it is also a centre for marine research and education with 25,000 sea creatures. Among them are the 2.5 metres long tiger sharks, as well as small members of the sea predator family. It has almost ten thousand sea creatures which include the large tiger sharks, groupers, giant stingrays, piranhas and octopus. The turkey’s first aquarium was opened in the year 2009. One of the biggest aquariums in the world has been situated in the area of eight square miles. The aquariums have its own rainforest and tropical seas zones. The various marine species like tiger sharks, groupers, giant stingrays, piranhas and octopus can be displayed in very twenty-nine different exhibitions. The aquarium has five million litres of seawater and tourist can able to see marine life through the thick glass and you can also swim with the species. Monterey Bay Aquarium, a non-profit public aquarium located in Monterey, California is known for its regional focus on the marine habitats of Monterey Bay. opened in the year 1984, it was the first aquarium in the USA to exhibit a living kelp forest and also display a great white shark. The organization also focuses on sea otters, various birds, and tunas and has also influenced the discussion surrounding sustainable seafood. Monterey Bay Aquarium was founded in 1984 on the Pacific Ocean shoreline on Cannery Row in Monterey, California. One of the largest aquariums to have successfully displayed a great white shark. Tourist can take a dive under a 360-degree video projection where you can see strange creatures which lurk deep in the oceans. uShaka Marine World is a world-class entertainment and tourism destination located in Durban. Spanning over 15 hectares of prime beach front, uShaka Marine World is one of the largest aquariums in the world and also the largest Marine Theme park in Africa. It features a 1200 seater dolphin stadium where one can find the world-famous Dolphins, the seal stadium and penguin rookery. Also, uShaka Marine World incorporates fresh and seawater, lush vegetation, natural materials and much more. The world-class tourism destination of South Africa is the 5th largest aquarium in the world by volume of water incorporated with water slides amusement park. There are special windows designed will enable you to see dolphin shows and animals both from the above and below the water. Shanghai Ocean Aquarium is the second largest Ocean Aquarium in the world that has more than 450 species of aquatic animals from the five continents and four oceans. It is separated into 9 distinct thematic zones, with a collection of more than 300 varieties of rare fish and more than 10,000 endangered rare creatures, such as poison dart frog, jellyfish, sunfish, Ye Hailong, emperor penguins, albino barramundi and so on. Also, it features a unique automatic pedestrian tunnel, that offers 180 degrees and 270 degrees panoramic views to the visitors. The aquarium is a setup of 4 underwater tunnels that allows you to view 180 or 270-degree os the marine wildlife. The total length of the tunnel is 168 metres and also rated as the longest submarine tunnels in the world. The special observation windows allow you to experience amazing underwater life without getting wet. There are around 300 varieties, 15,000 water creatures along with few endangered species of rare animals including some species of frog Du Jian, jellyfish, bluegill, Ye Hailong, the emperor penguins and albino Agkistrodon perch. Aquarium of Genoa or the Acquario di Genova is one of the most beautiful aquariums in Europe and also one of the largest of its type in the world. It houses more than 400 species of aquatic animals including the remarkable highlights of jellyfish. Opened in the year1992 it features a million visitors every year making it a great attraction for tourists. In fact, it is the only aquarium in Europe to house jellyfish, tropical fish, seals and much more in natural habitats. Apart from the sea tour, you can also take a walk in the tropical forests zone that is home to many different species in the world. There is a special garden room where you can see colibrì birds where these creatures fly freely among people. The Aquarium of Western Australia is Australia’s largest single aquarium and walk-through underwater tunnel. Covering the 12,000-kilometres long coastline of Western Australia, the aquarium specializes in marine animals and is home to approximately 400 different species of marine life, including more than 4,000 fish species. The underwater magic of the aquarium gives you the opportunity to see rare and unusual marine species. The public aquarium located in Toronto, Ontario, Canada. It was owned and operated by the Ripley entertainment and situated in the downtown of Toronto just near to the southeast of the CN Tower. One of the largest aquaria in the world has 5.7 million litres of freshwater habitats in the world. There are more than 450 species of seawater species in the aquarium. The Oceanarium aquarium is located in Lisbon, Portugal. The largest indoor aquarium in the world has a conceptual design architecture and it was designed by the Peter Chermayeff of Peter Chermayeff LLC while at Cambridge Seven Associates. One of the largest aquariums in the world has large species of marine life including penguins, seagulls and other birds; sea otters (mammals); sharks, rays, chimaeras, seahorses and other bony fish. Also, sea urchins, starfish and other species are seen in the aquarium. Also known as National Aquarium in Baltimore and previously known as Baltimore Aquarium situated in the 501 East Pratt Street on Pier 3 in the Inner Harbor area of downtown Baltimore, Maryland in the United States. The non-profit public aquarium was constructed during the urban renewal in Baltimore, the aquarium opened on August 8, 1981. According to the figures, approximately 1.5 million visitors come on a yearly basis and it is considered as the largest tourist attraction in the State of Maryland. It has 2,200,000 US gallons of water making it one of the largest aquarium in the world. There are approximately 750 species of marine life in the aquarium. The sea aquarium has more than eight million litres of water and hence known as eco-display of both flora and fauna of Southeast Asia. The visitors can see the beautiful coral reefs, open ocean and the deep sea. It was opened in 2000 and can only be accessed viaBurgers’ Bush. There are many different species that live together in the aquarium and all species are active during the day. One of the the second largest aquariums in the world where live corals are kept. The total amount of water is approximately 8 million litres. The aquarium is located in the Port Vell, a harbour in Barcelona, Catalonia, Spain. It is home to 11,000 animals representing 450 species in one of the largest aquariums in the world. The aquarium has a separate ocean tank for sharks, rays and other large fish which is 36m in diameter and 5m deep and contains approximately 3,700,000 l of water. 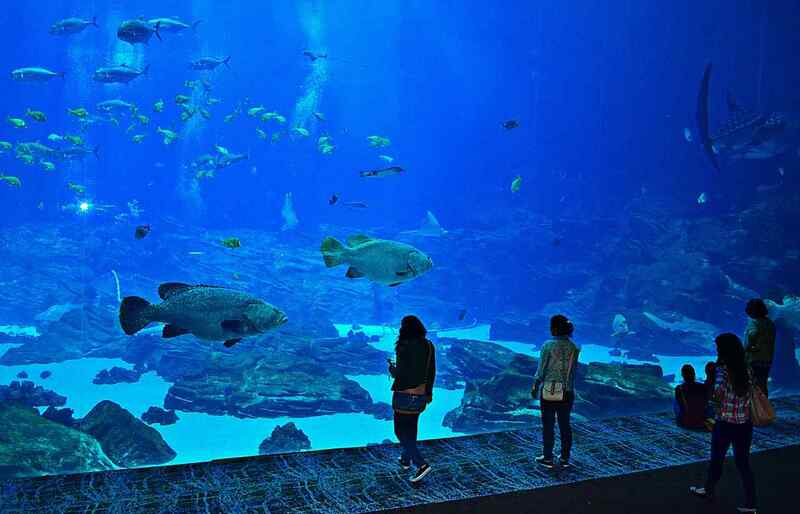 One of the largest aquariums in the world is a part of Aspro Parks. These are the 15 best and largest aquariums in the world in 2018. Do post your comments.